TO THE MEMBERS OF THE ASSOCIATION "EMOUNA FRATERNITÉ ALUMNI"
It is with joy that I welcome you on the occasion of your visit to Rome. In thanking you for the presentation of your Association, I want to express my cordial greetings to all its members, as well as to people of different religions and spiritualities to which you are connected. I give thanks to God for the existence of your association, born under the certificate "Emouna-L'Amphi des religions", proposed and initiated by the Institute of Political Studies of Paris, with the support of the great religions present in France. I am delighted, indeed, the shared ambition within your association that aims to strengthen the bonds of brotherhood between members of different religions, while deepening research work. In fact, as part of your curriculum, which I gratefully acknowledge the initiators and stakeholders, you attest to the opportunity to live a healthy pluralism, respectful of the differences and values ​​that both are carriers. And so, in a spirit of openness, you testify to the capacity of religions to participate in public debate within a secularized society (see Exhort, A. Evangelii Gaudium, Nos. 183 and 255). 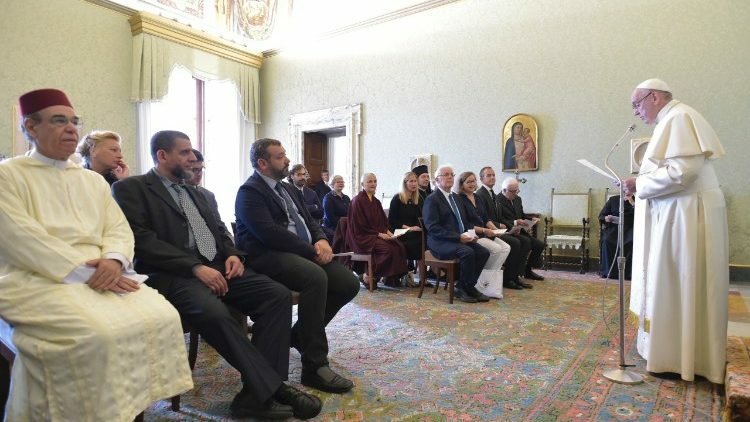 You also manifest, thanks to the fraternal bonds established between you, that the dialogue between the believers of the different religions is a necessary condition to contribute to peace in the world. I therefore encourage you to persevere in your approach, having at heart to combine three fundamental attitudes to help dialogue: the duty of identity, the courage of otherness and the sincerity of intentions. (Speech to participants at the International Peace Conference, Cairo, April 28, 2017). You know, indeed, that true fraternity can only be lived in this attitude of openness to others, which never aims at a conciliatory syncretism; on the contrary, it always sincerely seeks to enrich itself with differences, with the will to understand them in order to respect them better, for the good of each person resides in the good of all. I invite you to testify by the quality of your relations that "religion is not a problem but [that] it is part of the solution: it reminds us that we must raise the soul to the high to learn to build the city of men "(Ibid.). Thus, you can support each other to be like well-planted trees, rooted in the terrain of history and in your respective traditions; and in doing so, to contribute, with men and women of good will, to transform "the polluted air of hatred into the oxygen of fraternity every day" (ibid.). I encourage you to grow a culture of encounter and dialogue, to promote peace and to defend, with gentleness and respect, the sacredness of all human life against all forms of physical, social, educational or psychological violence. In exhorting you to pray for one another, I ask God for this gift of peace for each one of you. And I invoke the Father of all men to help you to progress as brothers on this path of encounter, dialogue and harmony in a spirit of collaboration and friendship. With this hope, I call the divine blessings on each one of you and on the members of the "Emouna Fraternity Alumni" association, as well as on all the people who participate in the program "Emouna-L'Amphi des religions". And, please, do not forget to pray for me too. Thank you.